First time on here, figure I start posting some stuff. 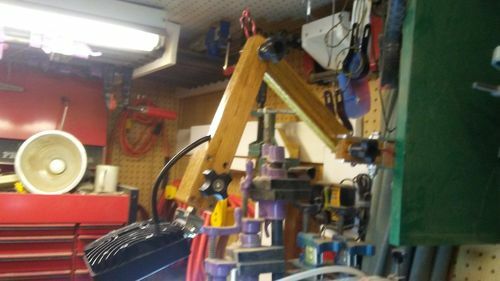 Detailed write up on my blog http://xylotekniche.com/2018/07/09/craftsman-14-bandsaw-modifications/. Basically added a flexible 12V LED lamp (which I found in a trash heap), and a mobile base to the bandsaw. More modifications to come in the future, but at the moment, these were critical modifications to get me started on some other projects. And yes, that 12V light switch does say “Zombie Lights”...b/c why not? “Yes, I want to post my finished project that is made of wood. You still have time to delete this and post it on your blog or in a forum. Rich, how does this not fit the description of a tool upgrade? You’re misreading it. It is saying only finished projects made of wood. The second sentence is clarifying things that don’t fit that description. Things like tool upgrades don’t fit it. Get it? Welcome to LJ. You’re off to a good start. Pretty slick idea. I am still working out the kinks on one for mine. Going to look something like this that I made for the scroll saw. Works off 12 volts but then I have 12 volt power in my shop so this is not a problem. A wall wart is not recommended, they overheat after prolonged use. Also, dig your tire brushes. Wanted to add those, but was getting lazy. Sent you a DM about them though.